A debut on Live and Loud! for XTC - but surely not the last time they will appear (I now have a few of their gigs on my "to be done" list). 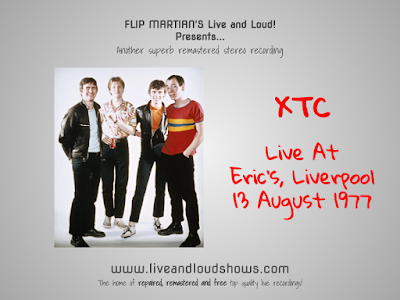 A very early gig this one - this was a soundboard recording from a gig played a couple of months before the release of their debut EP! It seems the source I received was worked on by someone at some stage, as, as so often happens, the loudness was off the scale almost and very unnatural, making it tiring to listen to. And quite toppy, with a shallow 2 dimensional aural range. So, I used EQ to not only improve the bottom end and clarity between the instruments but make it less tiring on the ears. Several hours of work later and it's a great show; the band are full of energy and it's a great - if short! - set. You can download this new and improved recording for free here as 1 MP3 file. Or, if you would like to have separate XTC-tagged MP3s, or even lossless files in FLAC format, head on over to the Donations tab to see how you can obtain these for a very small donation towards the site costs. this is really good, especially for hearing the the band's punk sound. a must for any xtc fan. Thanks for that; yeah they sound great here.